Home › Latest News › 5 Tips from a Female Rider! 5 Tips from a Female Rider! 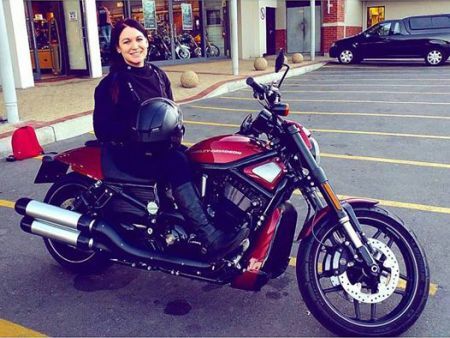 My name is Ash and I’m the lucky lady that gets to oversee the marketing for Harley-Davidson® Tyger Valley and Harley-Davidson® Durban. Coming into the riding lifestyle straight from a non-riding background really threw me in the deep end! I’ve learned 5 valuable lessons over the past 2 years at Harley® and today I’m sharing them with you. 1. People are going to stare. point or made a fool of themselves somehow. Get over it and put yourself out there! There’s only one way to learn. 2. Dirty hair gets 5 times dirtier when you’ve got a helmet on for most of the day. If you don’t want to feel like an unwashed heathen at your destination but you didn’t have time to wash your hair beforehand, no problem! Grab a cap with an adjustable back, clip it through your belt loop on your pants and when you get to your destination – cover that oily bird’s nest before anyone sees! Plus you avoid sunburn if you’ll be sitting outside. Being a lover of ripped jeans, I tend to wear all my riding gear but compromise by wearing “holey” pants when riding. I now bear the consequences in the form of scars both from sunburn and pipe burn on my legs. It’s up to you to decide whether you’d like a big red Harley® “tattoo” for the rest of your life on your leg. My thoughts? I should’ve just worn pants without holes. Fashion isn’t everything! We have a company policy of not being allowed to consume alcohol when riding a company bike. Do I feel as though I’ve missed out? NOT AT ALL. Firstly, you get some great non-alcoholic beer that tastes close to the real thing and leaves people around you feeling as though you’re participating in the same activities: no awkward empty hands! Secondly, I cannot tell you how many times I’ve ridden home alone in the dark from an outing and thought to myself – I’m SO glad that I’m alert and able to handle any tough calls I might have to make when anticipating bad driving from other roads users in a timeous manner. 5. Keeping up with the boys! All that I need to say on this point is: NEVER push yourself to ride faster than you’re comfortable with or in a reckless manner that you don’t feel good about just to “keep up with the boys”. I won’t allow myself to ever do something on the road that makes me feel in the least bit awkward. And let me tell you – in the short time that I’ve been riding – every person that has seen me hold back has respected me for it. If you’re ever in a situation where the people you’re riding with find you to be a burden: find yourself some new riding buddies! Don’t risk your life for a cheap thrill. With experience comes confidence and in due time you’ll be able to take calculated risks and have the skills to handle them. Enjoy the fresh air!